Half a world from where they were manufactured, Insta-Pro International® extruders are helping an East African company answer the needs of nutritionally-challenged children. Belete Beyene, managing director of Health Care Food Manufacturers PLC, has been looking for solutions to micronutrient and protein shortages that stunt children’s growth, since he went to work for Ethiopia’s Joint Nutrition Institute which was established with a Swedish cooperation when he was just 22. “In the famine of 1975, I saw how a blend of corn, soya, and instant milk could help these children where malnutrition affects a huge number of the population. But at that time, despite having our own formula called Faffa that was produced on a limited scale, we relied on the imported blended food coming from the United States to mitigate this large scale problem.” Then he thought; why not have the corn and soybeans grow in large quantities in Ethiopia? Why not produce this corn/soya blend in Ethiopia? By the next devastating drought, Beyene was running a government processing plant called the Faffa Factory, producing 33,000 tons of nutritional supplements per year. Ultimately, Belete’s vision led him to establish his own plant called Health Care Food Manufacturers and go to the University of Illinois to study soy processing. There, he saw the prototype for Insta-Pro Intl technology and bought his first Insta-Pro Intl extruder to become the first private corn/soy processing plant in Ethiopia. He went on to implement other Insta-Pro Intl processing technologies, such as ExPress® to produce partially defatted soy protein and soy oil and technologies to make textured soy protein. First he established his blending company to produce Corn-Soy Blend and soya oil. Then, based on his previous experience, he established a new processing plant to produce therapeutic foods. 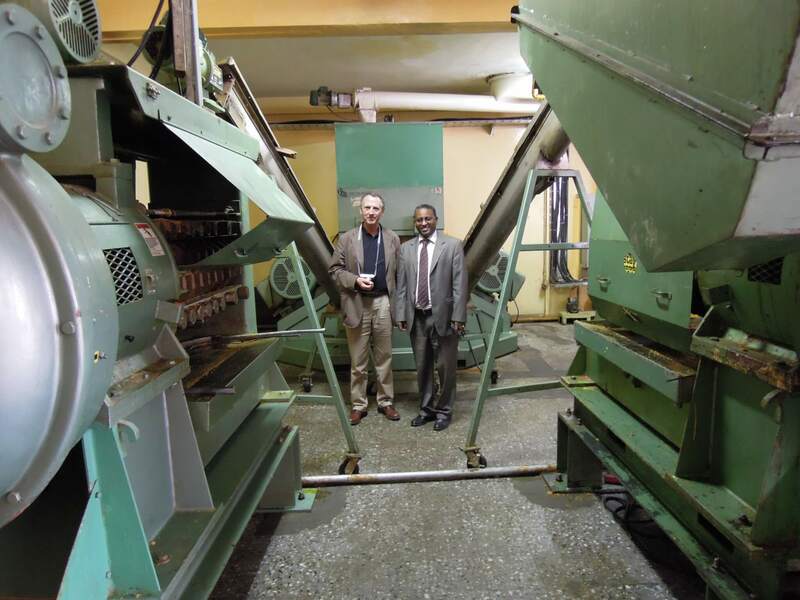 From an early production goal of 40 tons per month, Beyene’s company now produces 40 tons per day, and he continues to rely on Insta-Pro Intl extrusion technology. Versatility is increasingly important as Belete’s Hilina Enriched Foods Processing Center company manufactures and markets new products, such as; Plumpy-Nut® which is designed to treat severe to acute malnutrition, and Supplementary Plumpy® designed for moderate malnutrition. Both products contain soy ingredients made by Belete’s companies using Insta-Pro Intl’ equipment. The products are in paste form and packaged in single-serving foil pouched form that children can tear open and squeeze to eat without the challenge of adding water or cooking – a major attribute of Beyene’s company products. “We believe this has saved millions of children,” says Beyene, whose company now distributes products in Ethiopia, Kenya, Sudan, Somalia, Uganda, Rwanda, Djibouti, and Eritrea.